Doing what I do for a living generally is not stressful. I do my best to be somewhat laid back, taking things as they come (although still in a hurry) but every once in a while things can get a little hairy. Today I was starting to scramble as I get ready to go to the sign conference early Wednesday. There is still plenty to do (as always) and not much time to pull it off. 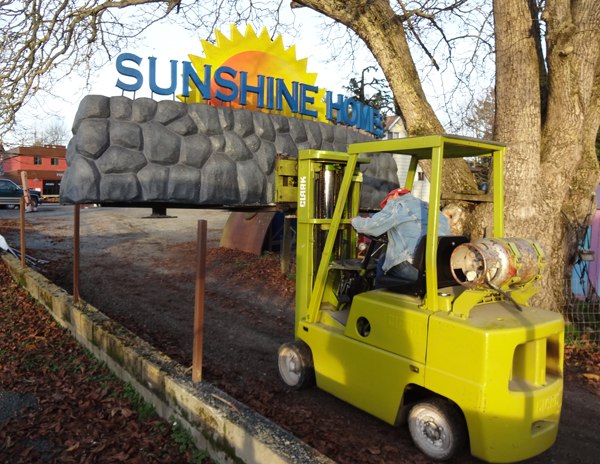 The truck that was coming to pick up the Sunshine Homes sign rescheduled the pickup that was supposed to happen a number of times last week until this afternoon. No problem. Then the driver phoned to tell me he would be late. No problem once more. I jumped in the truck to go to town before he got here instead of afterwards. Just as I finished my errands in town I got a phone call he was waiting at our place - more than an hour early. No problem once more for he would wait. The driver refused to back up the thre hundred foot long driveway. This happens occasionally (three times in ten years). No amount of coaxing would change his mind so we had to go for plan 'B' and bring the heavy and large sign to him. That would be a bit of a challenge without a doubt. The sign was fifteen feet wide. The driveway is thirteen feet wide between the tree and fence and narrowed again to twelve feet wide between the gate posts. So the sign would have to travel over both obstacles. The driveway is also gravel and somewhat soft in places so we were in for an immediate adventure as the small forklift digs in occasionally and then is very hard to get unstuck - especially with a load on board. It was nail biting time. I put on my bravest face and we set off down the driveway at a snails pace. The first obstacle was cleared without incident thanks to Sarah spotting on one side and big Matt on the other. The softest part of the driveway was then negotiated without incident. It's a good thing it wasn't raining! For the gate we had to lift the sign up well over six feet and travelled super slow. I was just a little tense as weeks of work balanced precariously on the end of the forks. That obstacle too was cleared without incident. 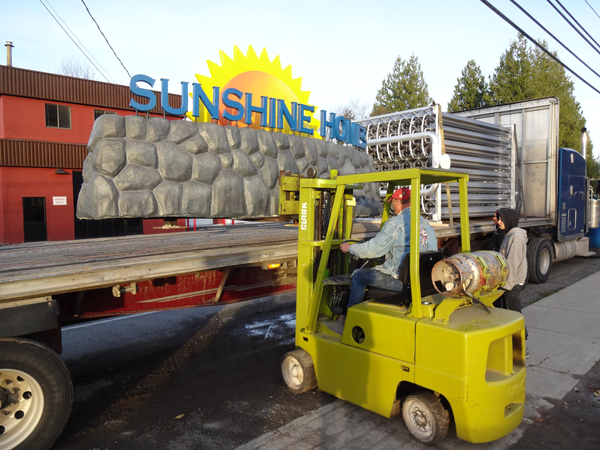 It was with great relief I set the 2500 lb sign gently onto the truck deck. It was no longer my resposibility at last! After that great adventure everything else suddenly seemed like small potatoes.